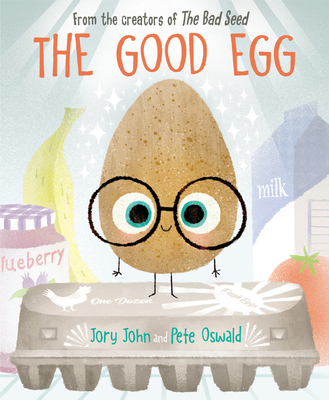 The Good Egg (Hardcover) | Turnrow Book Co.
Jory John is a New York Times bestselling author and two-time E. B. White Read Aloud Honor recipient. Jory’s work includes the award-winning Goodnight Already! series; the bestselling Terrible Two series; the popular picture books The Bad Seed, Penguin Problems, and Quit Calling Me a Monster! ; and the national bestseller All My Friends Are Dead, among other books. He lives in Oregon. You can visit him online at www.joryjohn.com. Pete Oswald is an LA-based artist, kid lit author/illustrator, and production designer. He is the co-creator of Mingo the Flamingo, published in 2017 by HarperCollins. Pete is also the illustrator of The Bad Seed, by Jory John. When Pete is not working on books he is helping to uplift many of the most successful animated franchises as a character designer, concept artist, and production designer. Pete lives in Santa Monica, California, with his wife and two sons.